What environmental challenges do China's political leaders face? Order "The River Runs Black." China's leaders face a daunting task. With one-quarter of the world's population, centuries of grand-scale campaigns to transform the natural environment for man's benefit, intensive and unfettered economic development, and – most recently – its entry into the global economy, China has laid waste to its resources. The results are evident everywhere. Water scarcity is an increasingly prevalent problem. Over one-quarter of China's land is now desert. China has lost twice as much forested land over the centuries as it now possesses. And air quality in many major cities ranks among the worst in the world. China's leaders must also now contend with growing public health problems. Rising rates of cancer, birth defects and other pollution-related illnesses have been documented throughout the country. The economic costs of China's environmental degradation are rising sharply. Most immediately, poor air and water quality have direct costs in terms of crop loss, missed days of work from respiratory disease and factory shutdowns from lack of water. Even greater challenges are on the horizon. Several of China's major river systems are running dry in places, necessitating huge and costly river diversion schemes. Much of China's north is under increasing threat of desertification, prompting vast afforestation schemes, with only mixed results. These depleted land and water resources, coupled with the river diversions, will contribute to migration on the scale of tens of millions over the next decades. While this will relieve population pressure on some of China's most overgrazed and intensively farmed land, it will increase the strain on many urban areas. Already cities such as Shanghai are experiencing significant stress to their sanitation and waste systems, as well as difficulty in gaining access to natural resources, such as water. At the same time, as the reforms have exacerbated old (as well as introduced new) environmental challenges, they have not managed to break free of other aspects of China's environmental legacy. Particularly damaging has been Beijing's continued reliance on campaigns to address vast, often complex environmental problems. History has demonstrated repeatedly that the challenges of deforestation, pollution and scarcity of natural resources are poorly addressed by grand-scale campaigns that attend little to the complex social, economic and environmental/scientific issues that underpin these challenges. Moreover, even as China assumes a leadership position in the global economy and the international community, its leaders struggle to move beyond traditional notions of security that contribute to large-scale development programs with potentially highly deleterious environmental consequences, such as the grain self-reliance and "Go West" campaigns. China's post-Mao leaders have developed a far more institutional system of governance, with a codified system of laws. This is a critical step forward for environmental protection. Still, by most measures, the central environmental protection bureaucracy in China remains weak. With roughly five times the population of the United States, China possesses a central environmental protection bureaucracy only one-twentieth as large. Central government funding for environmental protection – while increasing steadily over the course of the reform period – is still well under the level that Chinese experts claim is necessary to prevent further deterioration. China's weak enforcement of its own environmental protection laws also undermines the potential environmental advantages of foreign direct investment. Many multinationals complain that despite their best efforts, local officials and enterprise managers prefer not to use the pollution control technologies they provide in order to decrease the costs of operating the plants. Or, in other instances, foreign firms simply cannot compete against domestic firms that do not abide by the country's environmental regulations. China's leaders have also placed the future of environmental protection in the hands of the Chinese people, opening the door to grassroots activities, NGOs and the media. The Chinese government is wary of the potential for NGOs and the media to move beyond issues of local enforcement to criticize central government policy or potentially serve as a force for broader social change. The environment may serve as a locus for broader political discontent and calls for political reform, as it has in other countries. Given the dynamic nature of both China's economy and its evolving political system, assessing China's environmental future and its broader implications for the country and the world is no easy task. 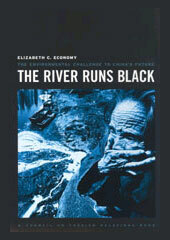 Reproduced from Elizabeth Economy, The River Runs Black: The Environmental Challenge to China’s Future. Copyright © 2004 by Cornell University. Used by permission of the publisher, Cornell University Press. Green GDP — The Real Chinese Revolution?